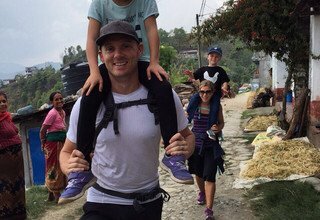 We stumbled upon the Swiss Family Treks website while researching family friendly Nepal holidays. We are so grateful that we chose them as our tour facilitators. Their friendly, prompt and detailed responses throughout our pre-trip communication was professional and appreciated. Our guides (Deepak and Hem) were outstanding: friendly, knowledgable, great with our children, flexible and helpful. We enjoyed each part of our itinerary immensely. Our itinerary was created keeping the young ages of our children in mind and Stefan did a great job with his recommendations and suggestions. Our family adventure to Nepal was one of the best vacations we have ever taken. The hotels were clean and simple, and we were informed that the restaurants suggested were already visited by Swiss Family Treks to ensure high standards. Stefan and his team did an amazing job planning and executing our adventure and we are beyond grateful for their efforts. It was also a treat for our family to dine with Stefan and Viana in their beautiful, warm home - what a special touch:-). Nepal is a beautiful and special place - it will not be our last visit there and it definitely will not be our last booking with Swiss Family Treks. I would recommend them to any of my friends, family or acquaintances. Thank you for making our trip a truly memorable one.